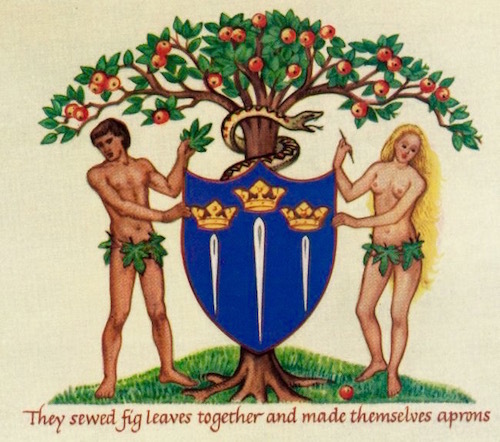 God slew the first animals and made skin garments for Adam and Eve after they had disobeyed God in the primordial Garden of Eden. (The Fall of Man in Genesis 3) According to the Bible, man’s first garments were animal skins. Maybe vine-like plants were used to fasten the garments on and over the body in very early man. But there is evidence that long-ago man sewed his clothes with an actual sewing needle. A bone sewing needle with a split head to grip the thread instead of an eye was found in a cave in Aurignacia, near Toulouse, France (See rendering left. The ‘hole” or fixing for the thread is on the right). 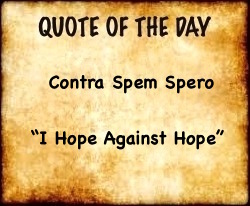 It is tentatively dated to c. 40,000 to 30,000 BC. 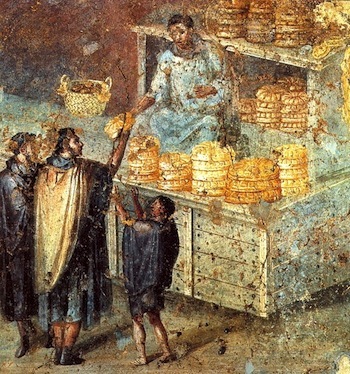 The “threads” were probably made of animal guts, sinews or flax. Starting in the 1970’s Russian scientists have been exploring a Siberian cave in Altai Krai, Russia (below). 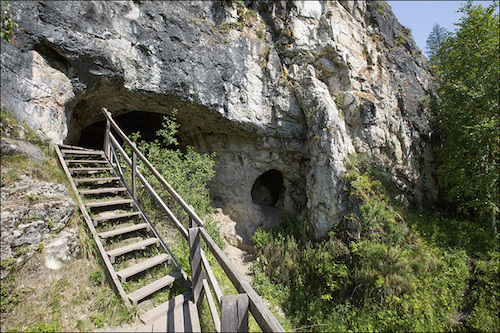 The Denisova Cave has a normal temperature of zero so they have found many well-preserved fossils and artifacts from early man. One of the most surprising discoveries in this primitive environment was a sewing needle made from the bone of a small bird. The added surprise was the needle had an eye perfectly fashioned into it. It must be stated that needles with eyes have been in use for millennia as demonstrated above. The earliest date, however, for the “invention” of the needle is, alternatively, given as 17,000 BC by some experts. 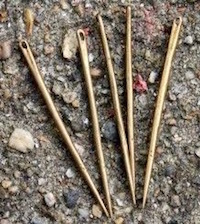 Needle-making in the English world arrived with a needle maker from Aachen, Germany named Elias Kraus who moved to Whitechapel, England in 1565. Whitechapel became the town from which needle-making spread to London and environs. Cromwell granted a charter to London’s needle makers in 1656 and they formed a guild called the Worshipful Company of Needlemakers. It is amazing, no matter how early, that primitive women (or men) “invented” the needle in order to sew pieces of cloth, tanned skin or other materials together to conform to body shapes or to make tents or other types of shelters. And then they thought of small eyes in the needles in order to facilitate the sewing process. Most of the needles from thousands of years ago have perfectly formed eyes. 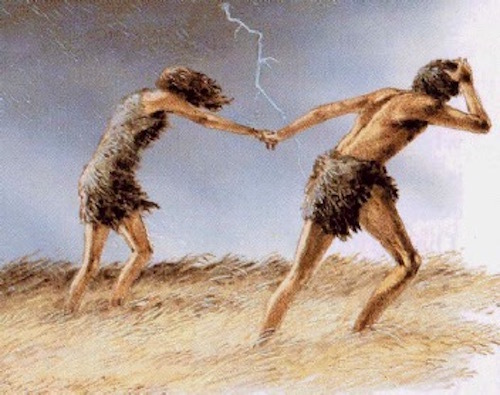 Early man had the awl, “a small pointed tool used for piercing holes, especially in leather.” There had to have been skilled workmen way back whose specialty was patiently puncturing the holes in the needles that would contain the flax, tanned leather threads or whatever material they used. The holes are perfect as though made by a machine. Thousands of years later in 1811 Abel and Michael Morall were the first to construct a machine solely for the pressing of eyes into needles. 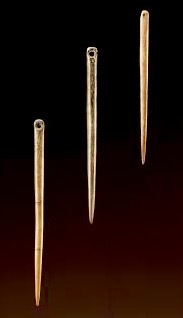 (Right – replicas of bronze needles from c. 2500BC).